Students piece together new careers and directions at the School of Continuing Studies. Still Friends After All These Years? Do you still hang out with your Northwestern classmates, suitemates and roommates? Do you have your own mini-reunions once a year? A gals' weekend get-together in the country? A guys' camping trip to the North Woods? A couples' weekend in New York City to catch the latest Broadway plays? Or maybe you take your family on vacation to visit your longtime Northwestern buddies who live in different cities? 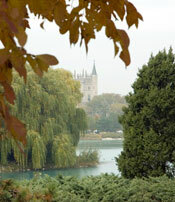 Northwestern magazine would like to hear about the lifelong group friendships you formed while you were studying here. Tell us about how you've managed to remain friends through the years, how you stay in touch and which activities you do together. We plan to feature these alumni circles of friends in an upcoming issue of the magazine. 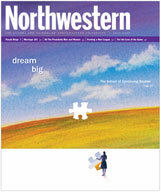 Please e-mail your anecdotes about your Northwestern forever friends to us at letters@northwestern.edu. Northwestern alumni of all stripes serve as college and university leaders throughout the land. The spirit of competition lives on Northwestern's intramural fields of play.